Sundays with Sandee- ssshhhhh I got some secrets to tell you! First...I am soooo sorry I forgot to announce the winner of my Helmar Collage & Craft Paste giveaway.. Contact me at sandeesetliff@yahoo.com so we can get your prize out to you! And for playing I'll do a sunshine project just for you! Don't hate me if you loooooooooooooooooovvvvvvveeeeeee this tool as much as I do and have to go out and buy one, cause it's absolutely fun, addicting and.....well, FUN! Oh yeah, it's a blast to use! Need to improve your lettering? Want to make it more fun? Want to see how happy I am to get this book? This is the gelli plate print that I thought I was working on, it's funny how it turned out to be only one of the ones I was actually working on at the time. I just didn't know it. I do plan on coming back to this one....but I got side tracked.....SQUIRREL!! My hand made stamp was created by using puffy paint on a piece of cardboard to create the raised areas. The size of the stamp is 8 x 12", so it's HUGE! It was inspired by Carolyn Dube a while back and it has become a favorite of mine to play with. So I thought I was finished and began the cleaning up process of taking packing tape to remove the dried up paint off of my gelli plate. I'm about ½ way done here, as you can see it does a pretty good job of removing the paint. Just press the tape down and rub it firmly with your fingers to burnish it onto the plate and then peel up. I learned that little tidbit from the Gelli Arts blog. So as I was peeling off the tape, which had a good amount of paint on it, the thought occurred to me to lay it back down over the journal page piece. Just to see how I liked it. I have to admit I fell in love with and it was not something I had set out to do. Funny how that happens, but now I was off on a totally new project. The painted packing tape gave it some color but it's still not very defined and it's very slick and shiny which represents a whole new set of challenges...what to do next? Sooooo....the day before I was discussing Sharpie Oil Based markers vrs their water based markers with Tamiko and she popped up a video which made me go...duh, me! It says that they aren't very good on chalky surfaces but work great on non porous materials....like packing tape perhaps? Let's give it a try! Loving the Oil Based Sharpie on the packing tape and used my regular Sharpie to draw in some black areas. I wanted to keep defining her so I took out my PITT pens to see what the results would be. I didn't worry about them beading up, because that effect made it look just like the gelli print...actually loved and created some shading...but I wanted to make sure it stuck to the tape so I sprayed the page with Helmars Crystal KOTE Varnish and crossed my fingers....and yay it worked! Here is the close up of the lips and under the chin where I did some shading. Finished it off with a quote and had a heck of time finding a black marker ( Sharpie is dry, need another!! lol ) but in the end I used a Montana Marker and the Sharpie Oil Based marker in white. Stick a fork in me, I'm DONE! The abbreviation for cyan (C), magenta (M), yellow (Y) and black (K). It is the colors used in a four color printing process. Hi everyone, you might remember my Wizard of Oz art journal page? It's entered in the Ranger Ink contest. I'd love some votes if you have a moment to spare, click on the little red heart that's on the top right hand corner of my picture. It's also the last day of the hop! I'd love for you to visit me over at the Helmar blog, I've been playing with my glue again and I discovered a fun way to use glitter with the Helmar Quick Dry Adhesive when I was making my Prima inspired shadow box album. Over on the Helmar blog you get a step out tutorial on how I used to embed trinkets into my glittered glue, but over here on my blog I have a very short slide show on the album itself. Sundays with Sandee - “Emails are a poke, but letters are a caress." As etiquette guru Letitia Baldridge advises, "nothing is more pleasant than receiving a beautiful letter", maybe we should extend that quote to include envelopes too! In researching the decline of the written letter I came across this interesting tidbit which just made me smile, wouldn't the aristocrats would roll over in their graves if they knew about e-mail, texting and twittering? "The decline of letter-writing far predates the Internet. “For many it started in 1840, with the first adhesive stamp,” Garfield writes. “The snobbish and well-to-do believed cheap postage would lead to the equivalent cheapening of an art form best left to the professionals.” In 1919, the Yale Review lamented that “the art of writing letters has been lost,” with blame cast on the telephone, the typewriter, the telegraph, even the train — for delivering letters too promptly." Write a friend today or maybe an elderly relative a note, make a hand made card for them and embellish the envelope, who knows, you might make their day. OK, are you ready to want another tool? Well, this is just AWESOME. The new Tim Holtz DistressMarker Spritzer Tool...only buy this is you want fine directed sprays of inks....like duh, who DOESN'T want that?? No blobbing or big splats, just fine little tiny dots!!! OH MY...this has now become my favorite play toy!! Thank you Vickie L. for letting me use the Dylusions Ruby Rainbow stamp, done on tissue paper and fussy cut out. She is colored in with PITT pens and then a sketchy outline was created around her. I was watching Terri Sproul the other night and she was doing an image transfer using a gel medium. It seems I have been seeing magazine transfers everywhere, maybe they are making a comeback? This one was done in 2 parts, the bottom ½ being one and the black ominous clouds above it done in a second session. I love the whole spooky scene. Journaling and outlining created with my Sakura Gelly Roll, Signo white pen. Page sprayed with Helmar Crystal KOTE Varnish. 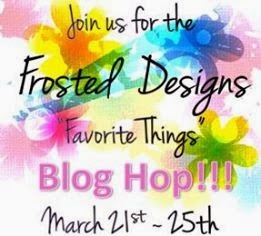 Frosted Designs "Favorite Things" Blog Hop post! If you've arrived here from Lori 's blog, then you're in the right place! If not, please start the hop at the Frosted Designs Blog here! Did you know that March is National Craft month?... ::gasp::....they only gave us one month?? It should be a yearly dedication!! lol To celebrate it, we are doing projects with our favorite things things from the store.....hmm..any guesses to what my favorite things are? How about the entire mixed media line of products in our store?? I made this Wizard of Oz page as it is one of my all time favorite movies and one of my favorite memories is my mom singing "Over the Rainbow" to me when I was a little girl. !!!!!!!!!! and we have Prizes !!!!!!!!!!! I'm also giving away a prize today! I am giving away a jar of Helmar's Decoupage & Craft Paste to a lucky commentator! 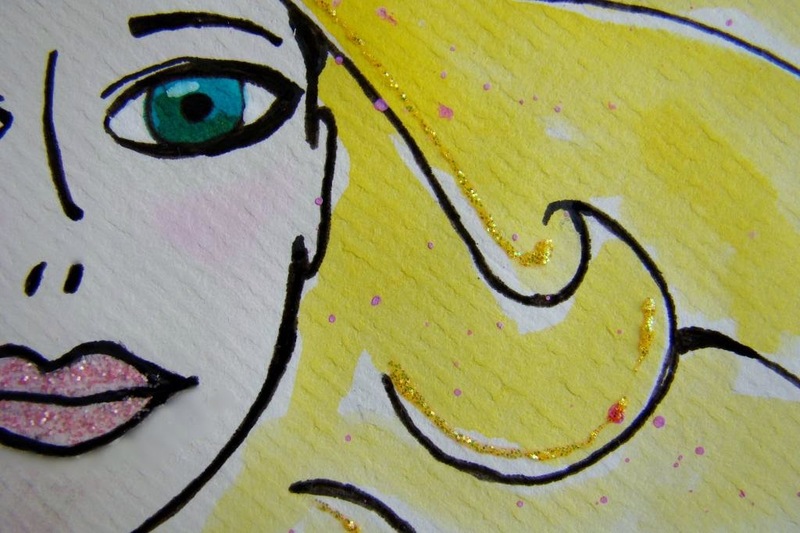 Please follow my blog, ( you don't have to, I'd just like it if you did, lol ) and leave me a comment saying what you would like to see me do in my art journal, I would love some ideas!! Here is the Blog Line-Up in case you get lost. Make sure to comment on all the blogs, unscramble all 12 words and e-mail Brandi with your answers. Make sure you collected all 12! Here is your word to unscramble, I provided a hint for you too! Here is my cover page for The Art of Whimsical Lettering with Joanne Sharpe online class. It's free if you have her new book :) I am using an old calender for my journal, that way I can hang it up to look at when I need the inspiration! One of the highlights to my design was writing Joanne's name inside the spoon, and then wouldn't you know it....I had forgotten to add the e on the end of her name...lol So I had to go back and squeeze it in and added the small flower on the other side to hopefully balance it out. The most tedious part was using a stencil to create the alphabet soup in the background, I had to make myself finish it cause I was bored, bored, bored. I have discovered I love the conceptual part of designing however I don't like coloring it in. and I am giving away a jar of Helmar Decoupage & Craft paste....those that visit my blog can earn extra entries by posting a project that you created during the "lettering to wall hanging" videos on the Frosted Designs FB page or by visiting me and I will give you ways to earn your extra entries. Vicki earns an extra entry by using her tracking skills as a border on this colorful page and posting it over on the FD FB page. Let's see.....what do you think I'll be making for this Sundays with Sandee? What do you think I made using the above for my Frosted Designs project today? I'd love for you to go visit and find out and leave me a comment! YOU are appreciated more than you know when you do this! 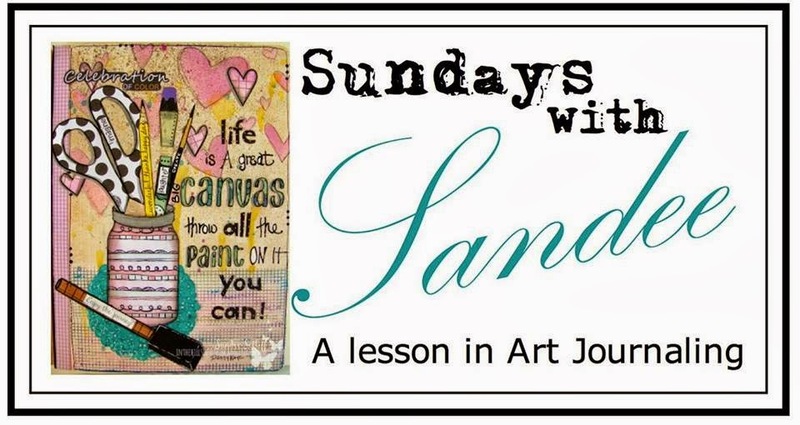 Did you play along with me during the "lettering to canvas" Sundays with Sandee? Everyone that does and posts their creations over on the Frosted Designs Face Book page gets their name put into the hat for the drawing! Here's Vicki L. sweet version of the journal page! AND guess what my favorite products are, come on guess! Where I will be giving away a jar of Helmar Decoupage & Craft paste when you stop by my blog and leave me a comment! Make any of the guess, correct or not, it doesn't matter, just leave me a comment and your name will go into the drawing! I love to give extra chances for those of you that actually stop by and see me! Well, another week has flown by and I hope that some of my northern friends are beginning to thaw out some! I have been getting my flower garden ready for spring and it's been so much fun finding out that I have crocus, hellebore, and today I found a hyacinth! It's taken 2 summers of untangling the over grown forest to discover these little hidden beauties! But we still have enough chilly wet days to be inside enjoying making some art and this week's part 3 of my series is the much awaited wall hanging! You can see it over at the Frosted Designs blog along with the video. Tamiko McCurry's cutest as ever fairy cards! and Tamiko took her's to the art journal page with a trio of sunflower girls! Thanks ladies for playing along, and your names have extra entries in my Helmar Decoupage & Craft Paste that I am giving away during our blog hop. The art of making objects of clay and firing them in a kiln. Wares of earthenware and porcelain, as well as sculpture are made by ceramists. Enamel is also a ceramic technique. Ceramic materials may be decorated with slip, engobe, or glaze, applied by a number of techniques, including resist, mishima, and sanggam. Pots made can be made by the coil, slab, some other manual technique, or on a potter’s wheel. It was such an endearing sight for me that I decided to try and paint them. My friend Vicki also borrowed my picture and did her version in water color, please go HERE to check out her work! I used inks and pens in my Dylusions journal for mine. We can blossom like a flower"
Sooooooooo....if you happen to visit my blog then you might know that our March kit is out, called A Moment in Time, which is gorgeous!! And to think kits like this can be delivered right to your front door! Does life get any better? Which brings us to the Kit Challenge !! Fell free to use other items as you normally would... Just be sure to include three of the above on your project to be entered in to win a fabulous prize! Check out the Frosted Designs Blog for details! There is nothing like a new medium and a new technique to get the old heart pumping. Sometimes in a good way and sometimes not so much. In my case I was overly excited about my Deco Art's Media Fluid Acrylics...just like spring I couldn't wait to get out there and play with them! As soon as I got them I researched Fluid Acrylics to learn as much as I could. So what are they? They are acrylic paints that have a thin consistency which is designed to spread and flow easily without sacrificing color intensity. I did discover that these are more heavy body and to do a true Acrylic pour technique you will need to add a touch of water and some type of medium like glazing liquid...BUT I do think they will be awesome on a gelli print and that is my next thing to try out, so enjoy the slideshow and next time we will do some mono printing!! A heavy, closely woven fabric; an oil painting on canvas fabric; the support used for an acrylic or oil painting that is typically made of linen or cotton, stretched very tightly and tacked onto a wooden frame. Linen is considered far superior to the heavy cotton for a canvas. So I might as well preface this with..."I stink at stenciling." There, I said it, it's now out in the open....::sigh::......but I need to learn, so with a less than positive attitude I got out the Authentique Flourish - Bloom paper from the A Moment in Time kit which is the softest pink color and little colorful blooms on the reverse side, ( you can see both sides here on my card ) my hoarding skills were going into overdrive as I cut into this paper! I took out the Tim Holtz Layered Stencil - Clockwork and the Tim Holtz Distress Paint - Picked Raspberry and daubbed it on, took off the stencil and groaned, what a mess! Determined not to waste the paper I went back to my usual habits and using my Gelly Roll black pen and traced the stencil...hmmmm...getting better but it still needed something. So I took out my Koi small waterbrush and some Dylusions Bubblegum Pink and White Linen and colored in the gears. I did appreciate how the Distress paint added another layer of color through the translucent inks. Lastly I took a grey PITT pen and gave the gears some shadowing and cut off the glorious little quote strip which comes attached to the papers and matted it. Then watered down some Black marble spray and used my large Koi waterbrush to darken the bloom paper a bit. I actually like how it came together in the end...but can we say stressful?